We were celebrating the third anniversary of Love Cake in February. There was cake all round for our theme of Cake for all. You can see the round up here. For this month I've been thinking about what the collective noun for a group of cakes is. Rather boringly it seems to be a batch of cakes. I was hoping for something like a sweetness of cakes or indeed a love of cakes. Whatever we're stuck with for this month I'm looking for recipes which gives more than one cake. 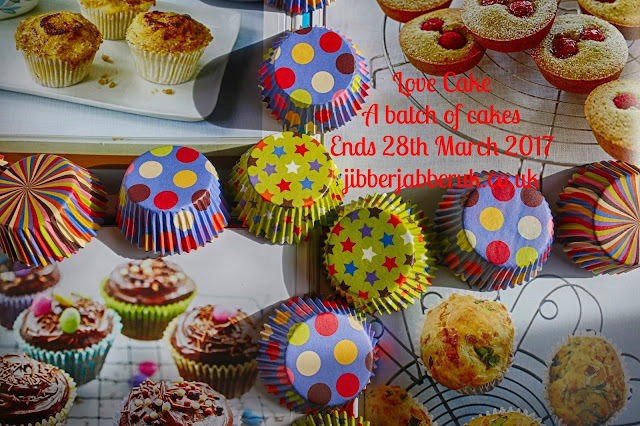 Think cupcakes, fairy cakes, muffins and loaf cakes – remember at least two makes a batch! Therefore the theme for this month is A BATCH OF CAKES. 1. Please make sure your entry conforms to this month's theme of A BATCH OF CAKES. 2. Post your photographs and description on your blog, Twitter, Facebook, Pinterest, Instagram, Tumblr or Google+ - just make sure they are for public viewing and can be seen by anyone. All photographs must be your own original image and not taken from another source. You can carefully style your photos or take a quick snap on your mobile – either is fine! 3. Enter the URL (web address) of your post into the Linky at the bottom of this post. Once the link closes on Tuesday 28th March 2017 at 23:55 no more entries will be accepted. 4. If you are putting your post on your blog please display the Love Cake badge and link back to this blog post. Old posts are accepted but please update them with the Love Cake badge and link. This is a blog hop so share the cake love around if you can. 6. By adding your link and image you agree to it being pinned to the Love Cake Pinterest board. 7. I would love to read about the recipe you have used to bake your cake. If the recipe is not yours please respect copyright and do not reproduce the original recipe in full but credit the source and link back to it. 8. You can link up your post to as many other blogging challenges you wish if it fits the theme. A comprehensive list can be found at The Food Blog Diary. At the end of the month I will do a round-up of all the entries and post it on this blog.